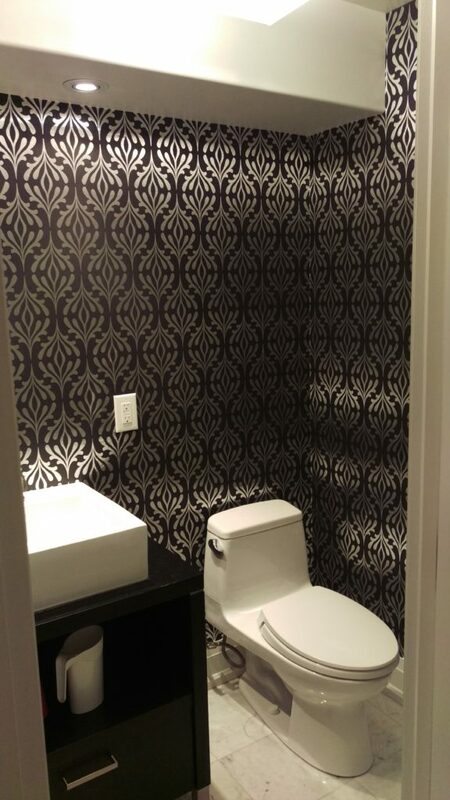 I have a dark wallpaper to install in my Toronto home. I’ve heard that the seams can really show on dark papers, how do you prevent this from happening? What is the issue with installing a wallpaper with a dark background colour? The basic issue is that if some precautions are not taken the seams will look lighter than the rest of the paper. The overall look then becomes little thin white lines at each seam and not a consistent background colour. When paste is put on the back of wallpaper, some wallpaper swells a little bit, then as the paper dries it can shrink back to it’s original dimensions. An inexperienced wallpaper installer might not account for this. 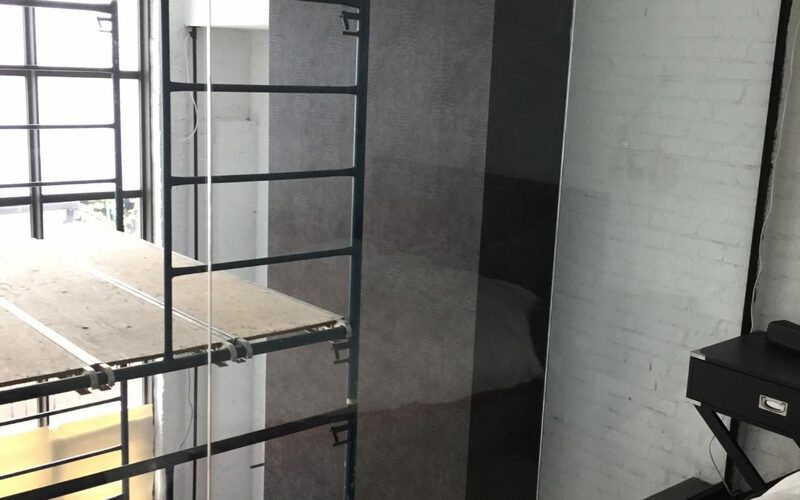 In this case they might install the wallpaper at it’s most swollen state and then as it dries, it shrinks back and exposes a sliver of the wall underneath. An experienced installer always read the instructions! The instructions will give how long to book the wallpaper (ie. let it sit so that it has a chance to swell and contract back). Some papers don’t swell very much at all. This is all vital information to make sure that once the wallpaper is dry, the seams stay tight. 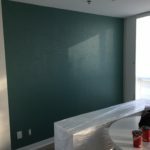 Despite all efforts to keep seams tight, a good precaution is to paint the walls the same colour as the wallpaper background. Then if seams open up a little bit, it’s not revealing white walls, but walls painted the same colour, thus hiding the seam. 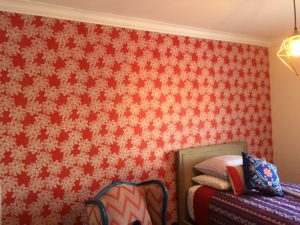 Regardless of the colour of the wallpaper, the backing of the paper is generally very light, This means that the edge of the paper is light as well. Sometimes this shows a little in the finished product, especially if the walls aren’t perfectly smooth. A good precaution is to colour the edge of the paper with a colour similar to the background colour, It can be done with a marker or pencil crayon when the paper is rolled up tight, this ensures that the colour only gets on the edge of the paper and not on the face. A couple of simple steps will ensure that the seams of darker wallpaper will be nicely hidden. 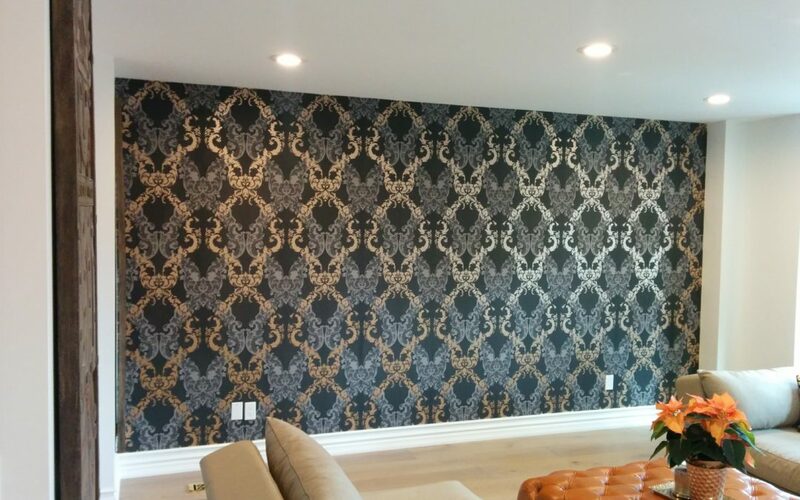 If you nave a dark wallpaper that you want installed (or any wallpaper for that matter) why don’t you book a quote? 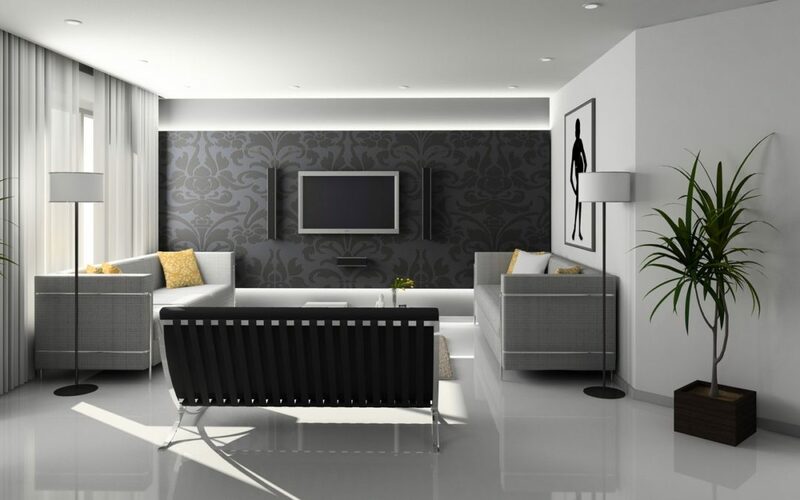 We’d be happy to Transform Your Home With Lasting Beauty! 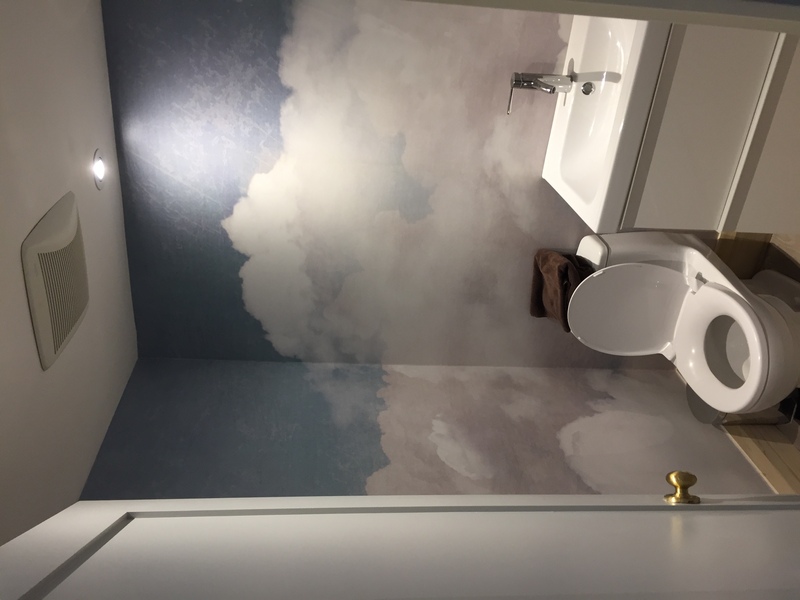 How much wallpaper is too much? 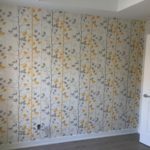 The first question you might ask is, 7 different types of wallpaper in one house, isn’t that a little much? The answer is a resounding NO! 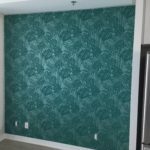 The client employed the services of an excellent interior designer, and all the different wallpaper worked well together. The master bedroom accent wall has a wonderful large scale botanical print, which really adds some punch to the room. The ensuite bathroom has a small geometric pattern. Geometric patterns are very popular in bathrooms, they can mimic the look of tile, at a fraction of the cost! This accent wall continues the botanical theme. The wall is an alcove of sorts, with the bulkhead above. One clever thing the interior designer did was select a very matte paper. Why was this clever? There’s pot-lights in the bulkhead overhead creating a very angular light source, if the paper had any gloss in it whatsoever, it would show seams and any slight imperfections in the wall. The matte paper is much more forgiving in this regard. In this room we have a tree print that really plays with the light. The print is a little more glossy than the background, so it changes depending on the angle that one looks at it. That’s just one reason why pictures of wallpaper don’t do it justice, one needs to see how light plays off the different textures and levels of sheen, really cool paper! 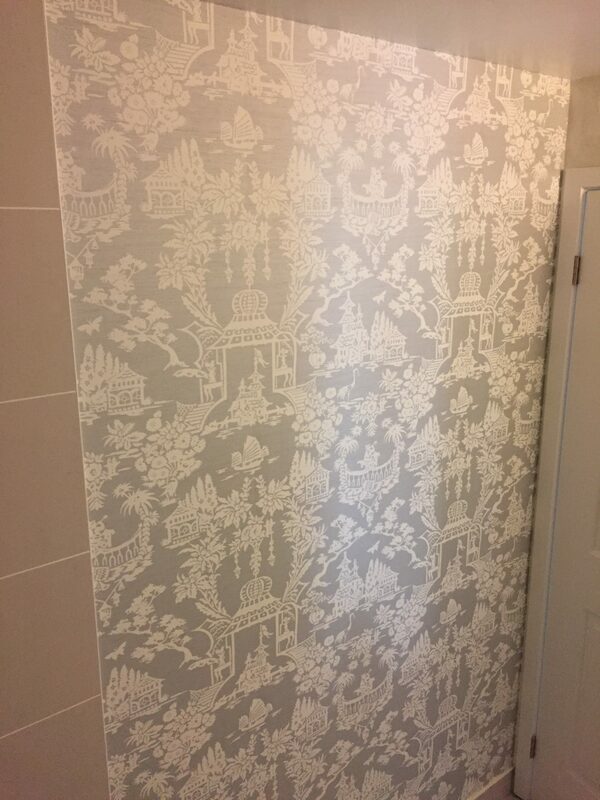 In the main bathroom the client picked a chinoiserie wallpaper and had me install it on the wall opposite the mirror. 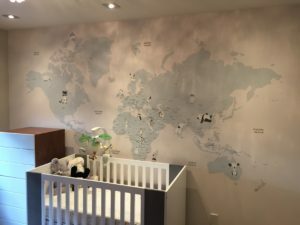 It was a wise choice to install it only on one wall, the pattern has a lot going on and would have been a little too much if installed on all the walls. On the main floor we did 2 accent walls, one in the dining room and one in the living room. Since the main floor is an open concept it was essential that the wallpaper harmonized with each other. One way to do this is to select the same wallpaper for both areas. 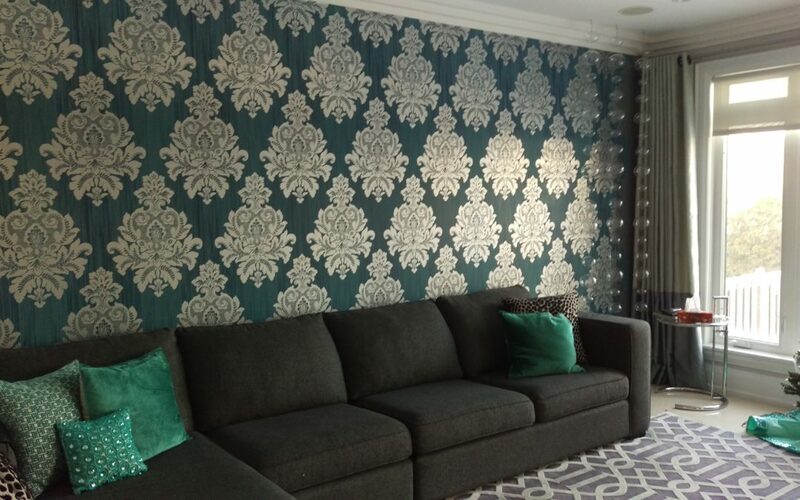 However, our client selected 2 types of wallpaper with the same colour, but different pattern. The best way to do this is to select 2 papers from the same collection which ensures that the colours will match. 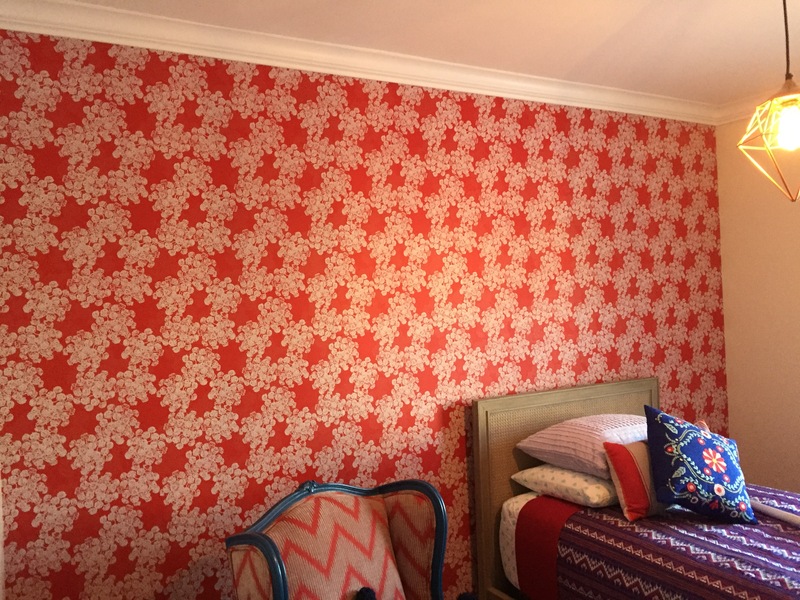 If you’d like to introduce some pattern into your home, why don’t you have us install some wallpaper accent walls? Book a quote, We’d love to Transform Your Home With Lasting Beauty! First, we had to make sure that we had wallpaper quantities properly calculated. The ceilings were 18’ high and it was a 15’ drop from ceiling to the top of the fireplace. Usually a double roll will do 3 to 4 drops (the distance from ceiling to top of baseboard), but in this case we were only able to get 2 drops out of each double roll. So, due to the longer drops we required more rolls of the wallpaper than a similar area with smaller drops. 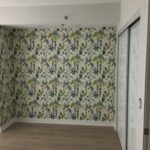 READ MORE: How many rolls of wallpaper should I order for my wallpaper project? The most obvious issue that had to be dealt with was accessing the two storey wall. If the fireplace wall was being painted we could just put up an extension to brush the top edge in and then roll everything else using a roller on an extension pole. Extension ladders are problematic with wallpaper installations because it has to be set up to one side in order to avoid the path of the strip of wallpaper. This means that the installer has to lean far to one side in order to install a strip of wallpaper, an awkward position to say the least. Step ladders are generally used on most wallpaper installations, which is fine on ceilings up to around 12’. 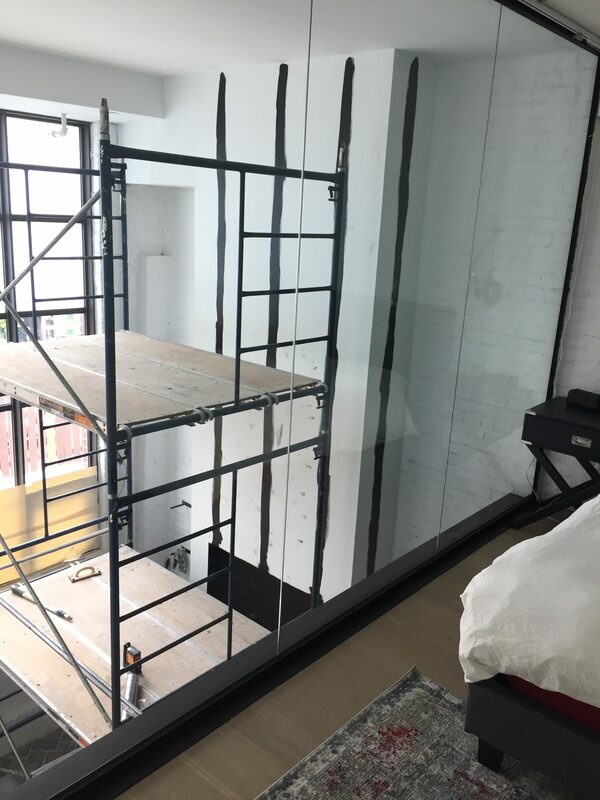 This particular installation would have required a 16’ step ladder, which wasn’t practical to get through condo hallways. Scaffolding was the best solution. 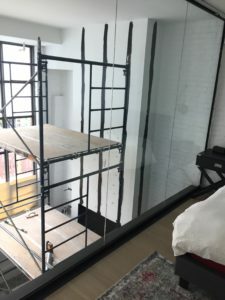 The scaffold frames were 5’x5’, which meant that they could be easily maneuvered through the hallways, and we could have brought them on a service elevator if we needed to. 3 levels of scaffolding were used, so the scaffolding height came to about 16’ when it was fully assembled. 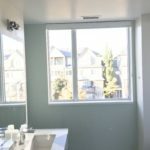 Once we had the access issue taken care of, the installation was fairly straightforward. Each strip was hung by two installers, the first on the top platform and the 2nd on the middle platform. Once the top portion was put in place the top platform installer would descend the floor to complete installation of the strip. Through proper planning we were able to take a complex install and turn it into a regular day at work. 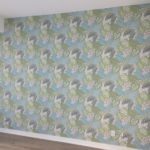 If you’d like CAM Painters to tackle your complex wallpaper installation why don’t you book a quote? We’d love to Transform Your Home With Lasting Beauty! One of the things we’ve been doing more of the last few years is mural installation. Murals are a specialty subset of wallpaper and were traditionally very hard to source. Traditional paint stores with their books of wallpaper, just weren’t able to offer them. 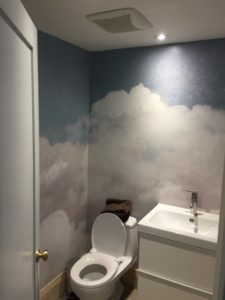 Now, however, with the popularity of online shopping, many websites specialize in offering wallpaper murals. 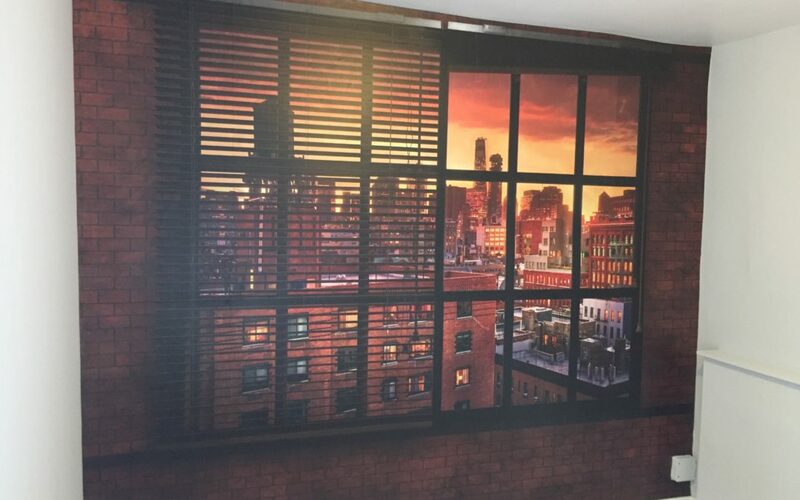 In fact, some printers will make a custom mural from any digital image you can supply them! 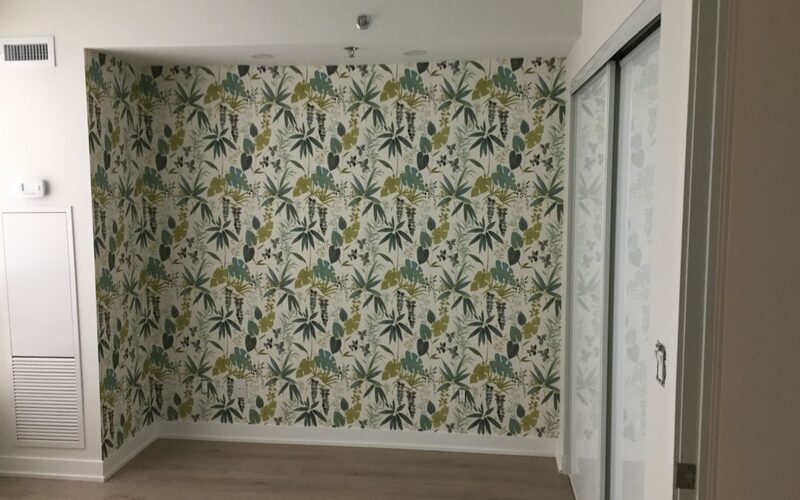 What’s the difference between traditional wallpaper and a wallpaper mural? The main difference is that wallpaper is a repetitive pattern, whereas a mural can be anything at all. Some popular murals can be city skylines, world maps, even a picture of a marble slab. 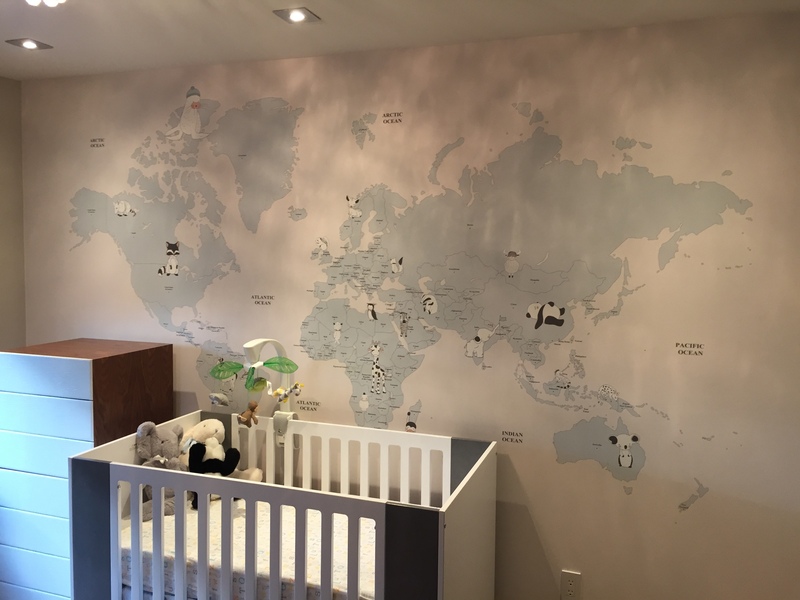 You want to make sure that the size of the mural will fit the size of your wall. If it’s too big for the wall you might lose some of the picture as it’s trimmed to size. If the mural is too small then it won’t fill the entire wall. Therefore, you want to purchase a mural that’s bigger than the wall it’s going on. A good rule of thumb is to have at least a couple of inches of waste, but not more than a foot. Therefore, if your wall is 8’h x 10’w you’ll want something that’s in the range of 8’2” to 9’ high by 10’2” to 11” wide. Is there a different installation process? Since there is no repetitive pattern to a mural, the picture is divided into numbered panels. 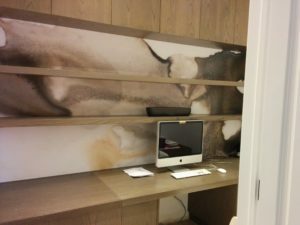 The actual installation process is no different than normal wallpaper, in most cases it uses the same paste and the same techniques. However, there’s no room for error, because if a panel is ruined, there’s nothing to fix it with. 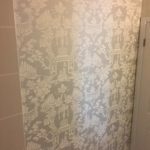 Therefore, when it comes to the installation you want to select an experienced wallpaper installer, rather than a novice. READ MORE: What are the 3 most important questions to ask your Toronto wallpaper installer? CAM Painters has taken on many mural installations and has the expertise to ensure your installation is done to the highest standards. Why don’t you book a quote? We’d love to Transform Your Home With Lasting Beauty!